When painting a portrait, knowing how to draw eyes is an essential skill. 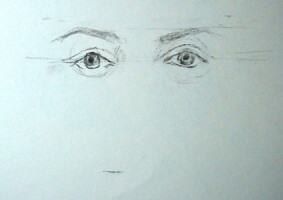 The eyes communicate a person's mood more than the mouth, and they are often the hardest part of a human face to draw. You need to learn some anatomy in order to know how to draw eyes in a convincing way. 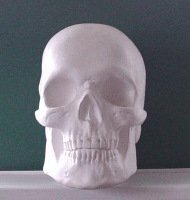 If you look at a human skull, you will see that the eye sockets are two big cavities next to the nasal and cheek bones. The eyes are spheres embedded in the sockets, with muscles and subcutaneous fat surrounding them. As a result, the lines around the eyes are round, and your drawings should reflect that. The eyeballs are considerably smaller than the sockets from which they protrude and this causes the corners of the eye to set well within the border of the orbit. The outer corner recedes more deeply than the inner corner and sits inside the plane of the temple. Notice that the outer corner is also somewhat higher than the inner corner. Here is a pair of eyes facing you straight on. I'm drawing both eyes because I think it is important to show each feature as it relates to the surrounding shapes—not just in isolation. I draw a horizontal line where the eyes are aligned. I place the two eyeballs on the line with one eyeball-width in between. I put the corneas with the iris right in the middle, and then color them in. The pupil is dark, and its shape will change depending on the light conditions. When in bright light, the pupil contracts, and when the light is dim it dilates. I add the eyebrow guidelines above the eyes; this helps me find the relative position of the eyebrows. Using the line, I place the peaks of the eyebrows and then draw their shape. I ask myself where the light is coming from and how it affects the planes of the eye, eyebrow and the bones around the eye sockets, and shade accordingly. Unless the model is wearing heavy mascara, remember to keep the lower lid line light. Similarly, don't make the eyebrows too dark, or they'll look like caterpillars! I 'wrap' the top eyelid like a piece of cloth over the eyeball area, paying attention to the subtle curves and the relationship with the surrounding features. The inner corners of the eyes are actually open, unlike that of the outer corners. Western eyes are likely to have folds above the upper eyelid. Look for the subtle undulation of both eyelids around the eye balls. Getting this right helps me convey the emotion of the model. 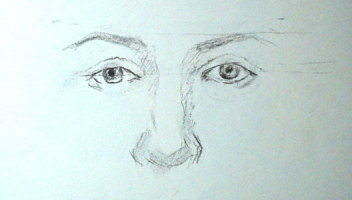 This is a quick demo I did at my home studio to show how to draw a frontal view of the eyes. Have fun as you learn how to draw eyes. If you experience frustration, fret not; I have drawn figures for many years, and I still find the eyes, mouth and nose challenging. You can also use this exercise that I learned when I was an art student. 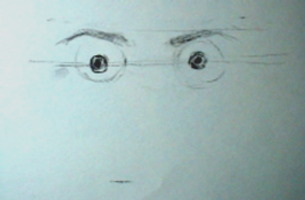 My teacher taught us to practice drawing eyes using ping pong balls. Wide rubber bands were positioned on the ping pong ball like eyelids, and I was supposed to draw it from many different perspectives. 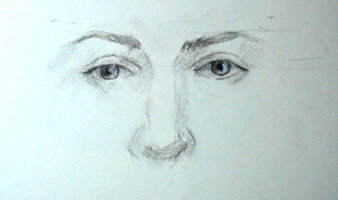 Practice drawing the eyes of different people, in different moods, and from a variety of angles. Keep it up, and you'll soon know how to draw eyes like a pro. 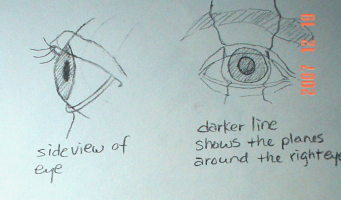 Below is a short video clip showing you how an eye is drawn. Enjoy it! 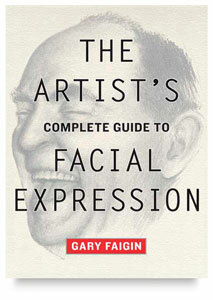 Discover how to capture the emotions on human faces.